Rarely is an actor's presence so commanding that just a few words, or even none at all, can say everything. 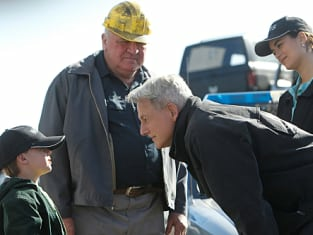 Mark Harmon has provided this presence on NCIS as Leroy Jethro Gibbs for seven seasons now, but perhaps never more than last night. The closing scene in "Borderland," featuring Harmon, Pauley Perrette (also brilliant) and a chilling score, left us hanging on every one of the few words. So little said so much. Abby knew. Gibbs knew Abby knew. Abby knew Gibbs knew she knew. The cold case she was working on in Mexico tied directly to her own boss, and it wasn't by accident. Rule #40: If you think someone's out to get you, they are. It wasn't alluded to directly, but we suspect Colonel Bell is behind this - and his counsel, M. Allison Hart (Rena Sofer), will find herself tangled up in it soon enough as well. Regardless, Abby's plea for Gibbs to love her no matter what she decides was as heartbreaking as her dilemma is compelling. Which side of her will win this internal conflict? Will Abby proceed with the case? How will Gibbs respond? The episode began as it always does. Our dead Marine was Corporal Ray Collins, and he was something of a shady character. The team thinks he was offed by a serial killer. Thanks to his GPS watch, Tony and Ziva learn that Collins was held in a semi-desolate spot for a few hours before his feet were cut off and his body was dumped. In a truck. With the feet of at least a half-dozen other victims. Collins was these victims' murderer, although that didn't explain how he ended up meeting a similar, grisly fate. But we soon learn he wasn't a serial killer, just a hired gun. The killer's killer turned out to be the initially cooperative bar owner, Violet, who was running drugs for a Mexican cartel. Collins was killing off her dealers and got in the way. 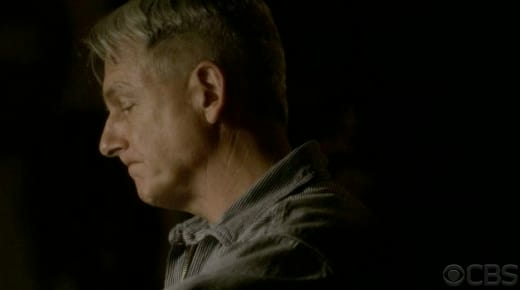 After she confessed to Gibbs, Violet suspects that Collins was working for the Reynosa Cartel, which for the first time tied in to the drama taking place south of the border. Alejandro Rivera of the Mexican DOJ (introduced in last week's "Obsession") invited Abby to teach a class. Vance sent McGee with her, which made for some fun moments. From Tim's recurring stomach woes to the rare shots of Pauley Perrette without makeup and passing references to their past relationship, every scene with them was great. Things got serious in a hurry, though, when Abby, McGee, and her forensics class were cornered by Paloma Reynosa, head of the Reynosa cartel, while working in the field. Rivera assigned Abby the case of a drug dealer killed 20 years ago. She tells the class that the dealer was killed by a sniper rifle, not at close range as originally reported. When Reynosa realized why Abby is there, she offered her a sniper's bullet attached to a necklace around her neck - evidence left behind at the scene two decades earlier. The pieces begin to come together: This victim is the Pedro Hernandez. Will Gibbs be done in by his own past, or is there more to it? Yes, drug the kingpin responsible for the deaths of Gibbs' wife and daughter. Gibbs sought and exacted vengeance. However justified, it's coming back to haunt him now. Another interesting allusion to Hernandez was made in March's "Mother's Day," where Gibbs helped Shannon's mom escape prosecution for seeking payback of her own. This story has been building for a long time, with some clues fairly obvious, but it's riveting nevertheless. With two episodes left, it will be fascinating to watch play out. One thing that doesn't quite add up is why the bullet was left at the scene in the first place. It seems too sloppy to have been an accident, especially for a professional. Granted, Gibbs was not with NCIS then, nor was he thinking the way the Gibbs of 2010 thinks. But the convenience with which Reynosa produced the evidence is fishy. We have to snag some of those NCIS hats like the kid got. Move over, Tiva... More McGee and Abby scenes, please! Ducky and Palmer's back-and-forth always entertains. Tony being so into the random chatting and being "nexted" was over the top, but still funny ... and the fact that McGee was sabotaging him made it even better. What did you think of last night's NCIS? What should Abby do, and will Gibbs pay a price for what he did? Leave a comment below with your opinions. Steve Marsi is the Managing Editor of TV Fanatic. Follow him on Google+ or email him here.